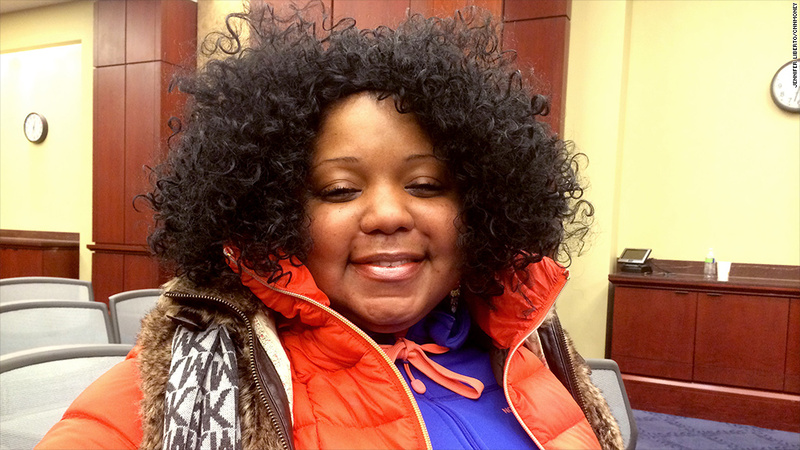 Charece Peterson was among a group of unemployed workers who hit the halls of Congress to lobby for an extension of federal jobless benefits. Charece Peterson is among dozens of jobless workers who knocked on the doors of members of Congress this week, pushing to reinstate unemployment insurance. After her jobless benefits expired last month, Peterson said she's had to survive by selling winter coats to pay for food and transportation. "I'm down to this last coat," she said, pointing to her pristine fluffy orange Michael Kors coat, a reminder of better times. "I don't want to lose it," said Peterson, whose hometown of Philadelphia faced a record low temperature of 4 degrees this week. Unemployed for the past year, Peterson is among 1.3 million who lost unemployment insurance benefits, starting Dec. 28. Peterson, 37, and her fellow unemployed workers were on Capitol Hill this week to share with lawmakers their challenges with job searches and how federal unemployment benefits help them keep looking. "It's tough to find a job when you don't have enough money to keep your cell phone on," said Peterson, who had a 15-year career at nursing homes and in-home health care companies, and is looking for similar jobs. Organized by the Philadelphia Unemployment Project, an advocacy group, the workers met with Pennsylvania Republican Reps. Jim Gerlach, Lou Barletta, Charles Dent and Michael Fitzpatrick as well as Democratic Reps. Bob Brady, Allyson Schwartz and Chaka Fattah. "We explained we needed the unemployment benefits to get our resumés together and to take transportation to get to job fairs," said Deborah Whiteside, 50, a nurse whose benefits ended last week. Whiteside lost her job a year ago, after working 20 years. It's the first time she's been unemployed. "And it's not just us. When I go to job fairs, there are usually 200 people in line for the same job," she told lawmakers. Share your story: Have you lost benefits? Jobless benefits have been front and center in Washington all week, as lawmakers debated whether to extend them. The federal benefits first went into effect during the recession in June 2008. It was put in place to help unemployed workers who couldn't find jobs and whose state unemployment insurance had run out. The stimulus era measure expired the week of December 28. Every week that passes, 72,000 unemployed workers, on average, exhaust state unemployment benefits and won't have federal benefits to turn to, according to the National Employment Law Project.